Green Day is a pop punk/alternative rock band from East Bay, California that formed in 1987. They were originally called Sweet Children, but changed their name before their first release. Drums: John Kiffmeyer alias Al Sobrante until 1990. With snappy, three-chord songs driven by effectively unshakable rhythms and squinty-faced vocals, Green Day have set the standard for Punk-Pop. Though the genre existed before their time, this Bay Area trio -- under the tutelage of Lookout! Records co-founder Larry Livermore -- helped resurrect the catchy, two-and-a-half-minute pop song. 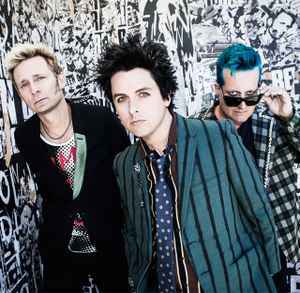 Green Day came together at a time when Berkeley, Calif., was bubbling with new bands who were blowing air into Punk's gasping lungs. They quickly became local favorites, frequently playing 924 Gilman St. and helping to establish the venue's legendary status. Constant touring spread their easily digestible songs the world over, and Green Day began attracting considerable attention. Though not the first Bay Area Punk band to sign with a major label, they have certainly gone on to be the biggest. Despite criticism and cries of, "sell out!" Green Day remain as obnoxious and wily as when they were teenagers. Dookie was the first album I ever bought. That album has obvious appeal to a 10 year old, but coming back to it after 14 years it seems as timeless as the Buzzcocks or the Replacements or anything else that I only bothered to get into after the MP3 revolution. Little did I know in 1994 that they would become the superband that they are now, bridging generation gaps and such with their very opportunistic "American Idiot". It's easy to hate a band that charges $50+ for concert tickets for what even now can be pigeonholed as Ramones style power punk, maybe with a bit of post-production gloss. Even as gifted as they are with crafting those kinds of pop rock songs, they never struck me as a "talented" band, the kind that would be fetching that sort of arena rock entry fee, but win a couple Grammys and I suppose the shoe fits. Nevertheless I still appreciate this band despite selling out or whatever it is that they've done. It's not like they made themselves out to be the kind of people that would care about such a thing. Dookie is still an amazing pop album, American Idiot succeeds most of the time despite its blatant theatrics, and on the albums in the middle you'll find a goldmine of well made pop songs. You'd probably catch me listening to Dead Can Dance or Miles Davis before these guys nowadays, and with 21st Century Breakdown it seems they're having a lot of trouble trying to top American Idiot, but Dookie was a fine entry into the world of music that I don't regret. Ok, they're Punk, although not living like punks - even less that they would die for it. When ´Dookie´ hit the charts, they weren't even that young to claim music for teens - still in Punk or whatever's left of its 70s fashion commodity, Green Day turned into 'idiots' they refuse to be.